We made these cushions using a left over layer cake square for one of them, and for the others we cut fabric from our scrap stash. They look lovely when they are finished and they take hardly any time at all to make. 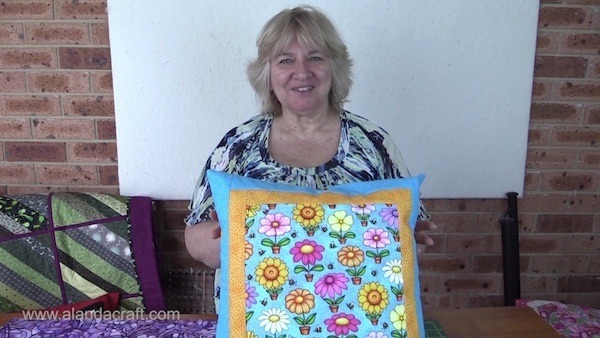 The measurements are for a 16″ finished cushion cover. 1 @ 10″ square for the centre piece. 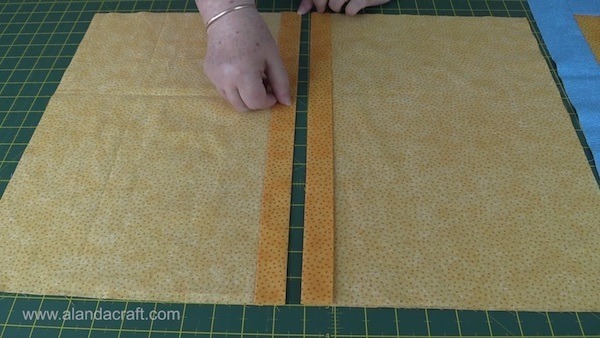 Sew the two short side sashing strips, one to the top and one to the bottom of the centre piece. Press the seams to the outside edge. Sew the long sashing strips, one on each side of the centre piece. 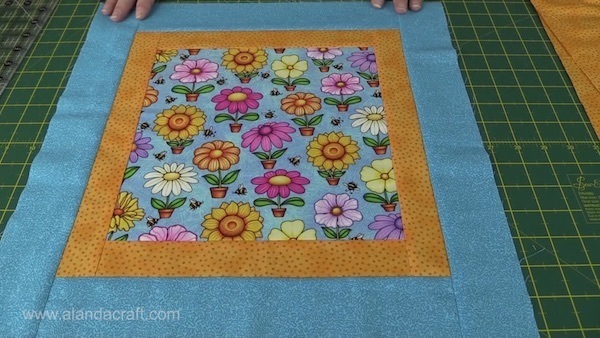 Sew the small border pieces to the top and bottom of the centre piece. 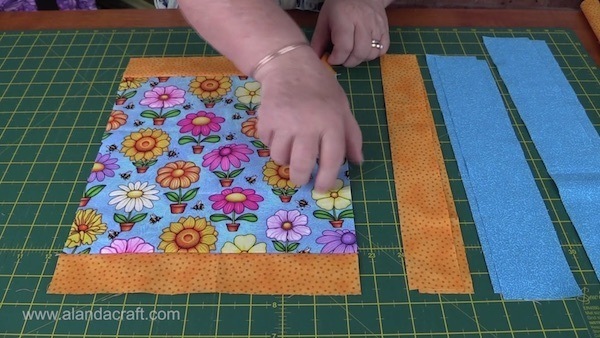 Sew the long border pieces to the sides of the centre piece. Press to the outside edge. This is how to give the top of the envelope pieces a nice, neat finish. Draw a line a ¼” along the long edge. Draw a line 1″ from the pressed edge as shown in the image below. Top stitch approx 1/16″ in from the 1″ fold line. 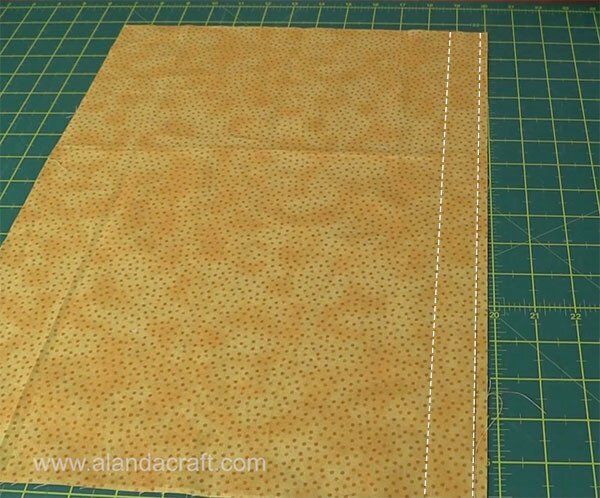 Top stitch approx 1/16″ along the edge of the 1″ folded edge as shown below. Repeat with the other backing piece. 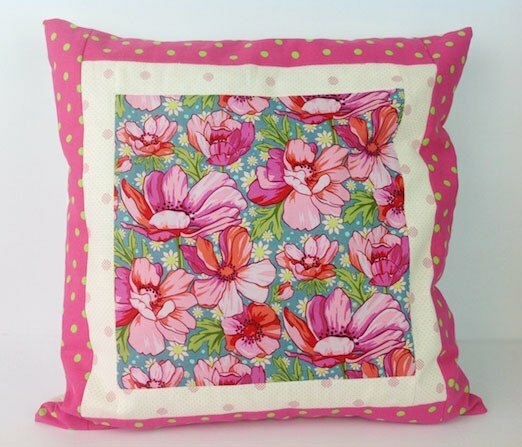 Lay the front of your cushion cover, right side up, on your workspace. Lay the other back cover piece so that it overlaps the first back cover piece. Pin around the edge taking particular care when pinning the overlapped pieces. You want to make sure that the underneath piece doesn’t move while you are sewing, so pin it well. 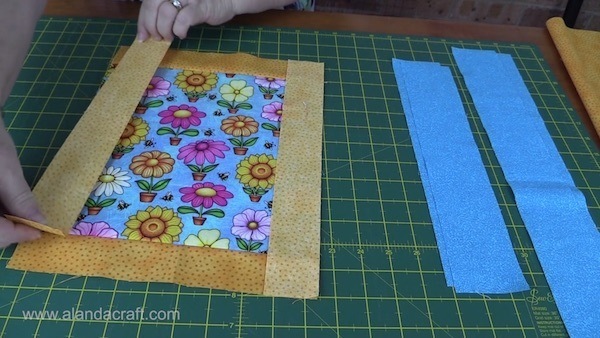 Sew around the edge with a ¼” seam. Clip the corners taking care not to cut your stitching. If you like a full, poofy look then insert a 16″ cushion insert. If you prefer a not so full look then use a 14″ or 15″ cushion insert. 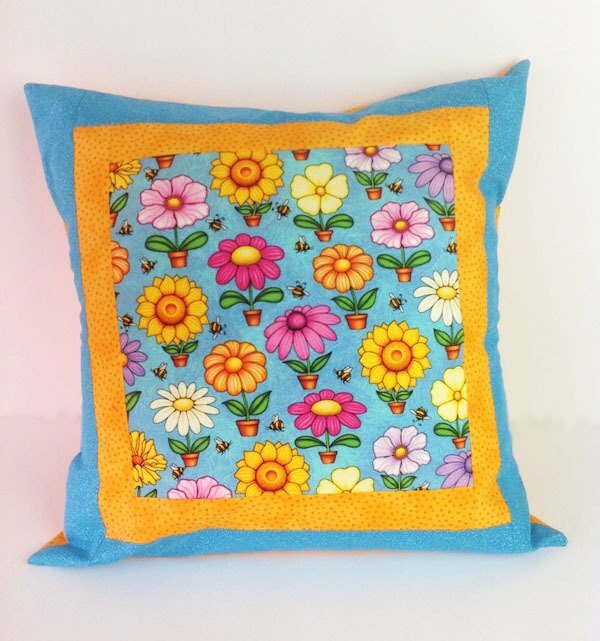 These cushion covers are so quick and easy to make. 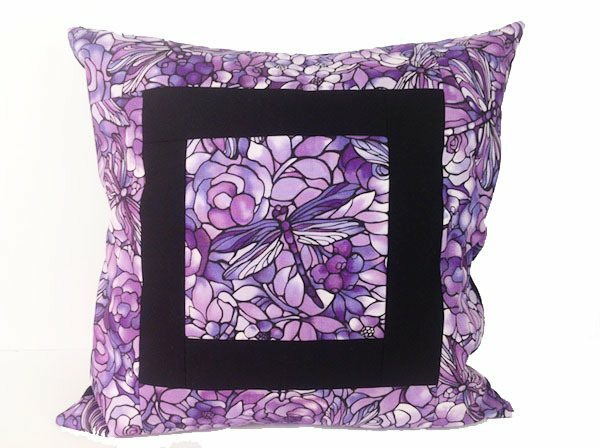 You can also change the look of the front as you can see in the purple and black cushion cover. Here I have made the centrepiece section smaller and increased the size of the sashing and border. I really like this…thank you. For an 18″ insert form would I use 14 or 15″ x 18 1/2″ pieces for the back part. You used 13×16 1/2″. Thank you. I would cut the back pieces at 14″. What I did was divide the cushion size 16½” by 2 = 8 1/4″, I ignored the 1/4″ and added 5″. So 8″+5″ = 13″. In your case divide 18½” by 2 = 9 1/4″, ignore the 1/4″, and add 5″ to the 9″ = 14″. You could go with 15″ but 14″ should be fine.Hope this helps. Thank you Marion. Some of them were leftovers from other projects and some were fat quarters. 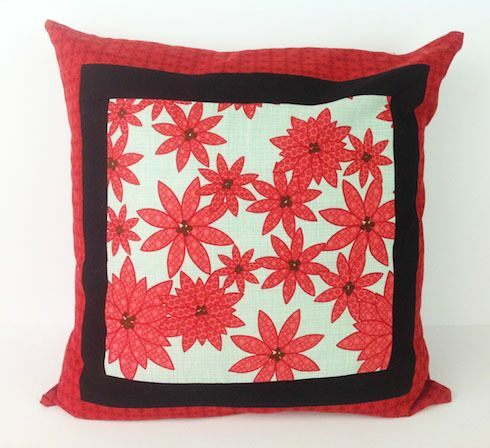 The beauty of these cushion covers is you can use up your fabric scraps. 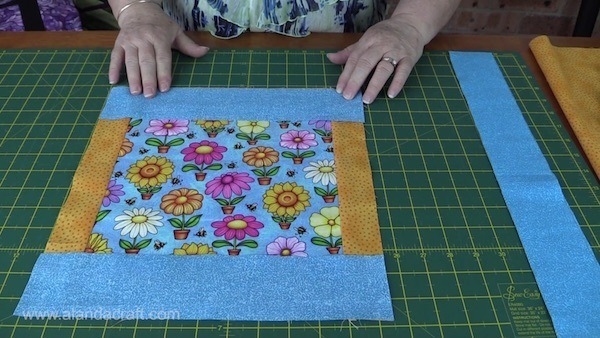 Why you could even make a crumb quilt piece for the centre. Or do as one of our ladies did, she used an embroidered block she had made. So there is so much you can do with this one.